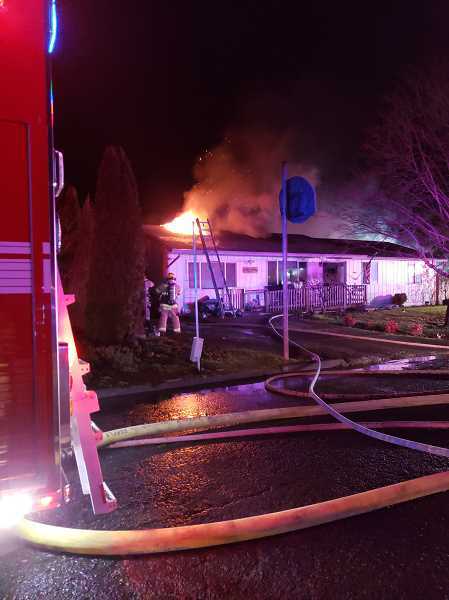 Five adults and a child have been displaced after flames consumed much of their home in Molalla early Sunday morning. Fire crews responded to the 500 block of Carol Court in Molalla around midnight on Sunday, Jan. 6, according to Molalla Fire Lieutenant Byron Wakefield. Wakefield said the fire appears to have started in an RV trailer behind the house, and with the high-speed winds that morning, it quickly spread to the house. The left side of the house was lost. But, according to Wakefield, the home may not be a total loss. "It can be rebuilt, but there's a lot of smoke damage throughout the whole house," Wakefield said. During the fire, the homeowner informed fire crews they had two cats still in the home. The team went in and found one large cat, which Wakefield returned to the owner. But the other cat was still missing. Fire crews went back and found it in a bedroom between the bed and a wall, but it was barely moving. 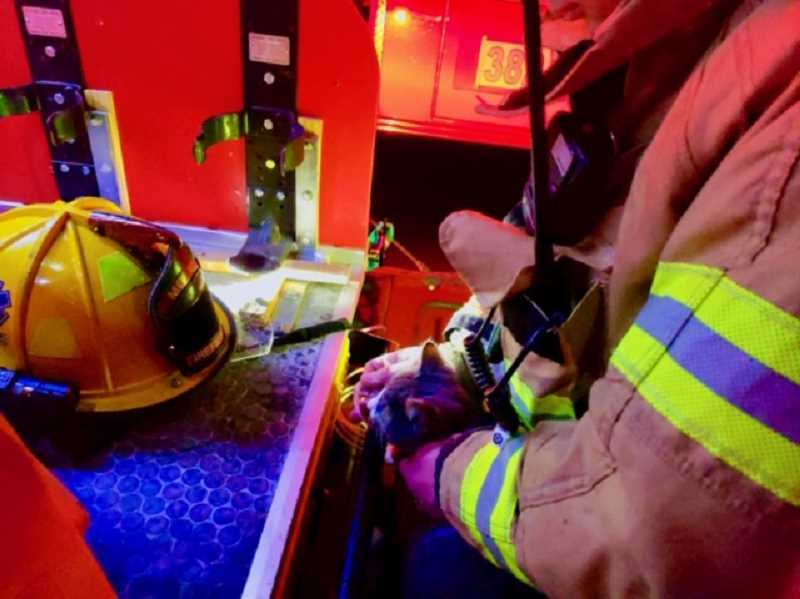 Wakefield passed the cat to Firefighter Loren Johnson, and asked him to take care of the cat. "He went to the engine and gave the cat blow-by oxygen," Wakefield said. Johnson revived the cat and returned it to the homeowner. Molalla Fire was assisted by Colton Fire and Clackamas Fire. Wakefield said they arrived around midnight and had tackled the flames by 3:20 a.m.
Molalla Fire called on The American Red Cross to help the residents in crisis. The American Red Cross Cascades Region responded to the home at around 2:30 a.m. when the fire was still happening, according to an American Red Cross press release. They provided resources to help address the immediate basic needs of the residents such as temporary housing, food, clothing, comfort kits with toiletry items, information about recovery services, health services and mental health services. For those who wish to help the fire victims and others like them, Molalla Fire Chaplain Liz Williams encourages people to donate to local organizations in honor of the Carol Court victims. "There's a lot of help available already, so it's a call to arms for people to look into who they work with or who they volunteer with," Williams said. "Local churches offer aide; if you exercise, various health clubs have various ways of helping…Look into the organizations that you're a part of…and donate in their honor. "I'm a person of faith," she added, "and I believe the power of prayer and that our community will pray for these people to be able to reestablish themselves."